A tongue-in-cheek way to embrace my misanthropic side. A vintage jean offset by a black bow is a trend and look I&apos;ve always loved but never fully embraced until I saw Sienna Miller (who&apos;s long been one of fashion icons) wear it recently. The black ribbon looked so pretty against her blonde hair, and felt nostalgic but not cloying. To offset the femininity of the bow, I wore it with a cool boyfriend-fit tee from a brand that offers custom embroidery on their shirts. Alina and Leslie have the same shirt and each opted for their names embroidered, but I wanted something a little more tongue-in-cheek. 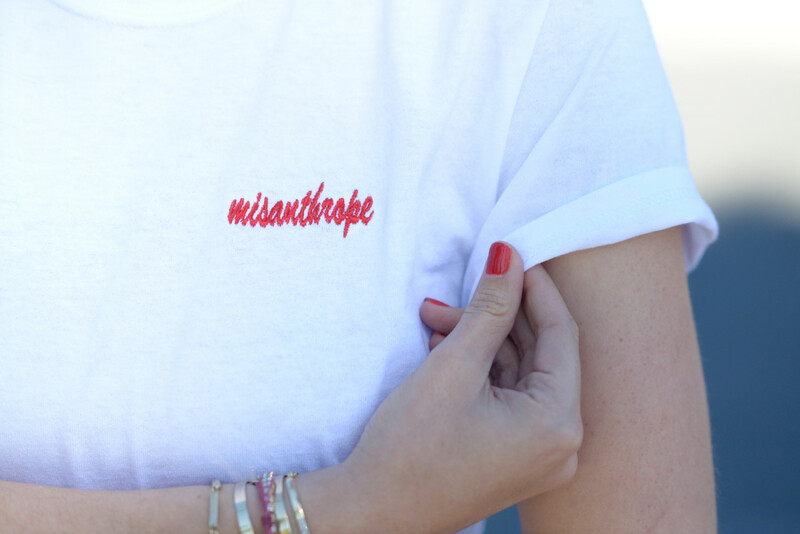 After throwing a couple words around, I finally settled on "Misanthrope" which is, intentionally, the last thing you&apos;d think of when you picture a hair ribbon.